“Babies and children can easily overheat in hot weather so it is important that you help them stay cool” said the nurse manager of Child and Family Health Services, Paola Gordon. 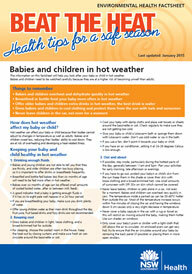 Babies and young children are not very good at adjusting to weather changes like adults are. This is why they can get very hot and find it hard to cool down. “One of the most important things you can do is to make sure your baby has enough fluids,” said Paola. This means that babies will need breastmilk more often than usual. One of the ways you can tell that your baby has had enough water is if they have six to eight pale, wet nappies in 24 hours. For older children, water is the best drink, especially when it is hot. Make sure your child drinks lots of water during the day to help them stay hydrated. It is also important that you drink enough water during the day, especially if you are breastfeeding. “No beanies, jumpers, socks or blankets in hot weather. Babies and children should be in light, loose clothing. They can even get away with just a nappy when it’s really hot,” said Paola. If you are going outside in the heat make sure your child is wearing a hat and sunscreen. Try to plan your activities in the early morning or late afternoon, when it is cooler. If you do have to go outside make sure you take special care to keep your little one safe and cool. What if the power or water stops working? Hot weather can sometimes cause power outages or water shortages. You can also report the power outage to your energy provider and ask when it is likely to be restored. If your child is showing any of these signs talk to your local doctor or call Health Direct on 1800 022 222 to speak to a health professional. 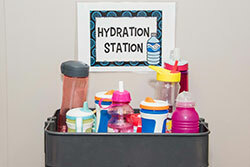 Make sure your child has lots of fluids (breastmilk for babies, water for children). See the factsheet for more information.